Apparently the monolithic corporation is just misunderstood. 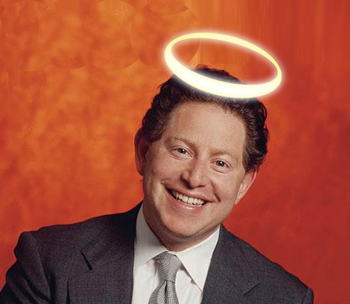 Making fun of Activision is as simple as drawing a crude pair of horns on a picture of Bobby Kotick, and many would argue for good reason. However, Dee Brown, head of Beenox studio which was acquired by Activision back in 2005, says the publisher's reputation for cartoonish evilness isn't entirely deserved. "I would certainly say from an internal perspective that the reputation Activision has acquired is probably unfair," he told GamesIndustry International. "Beenox was acquired in 2005, so it has been six years now that we've been with Activision. We had to work with Activision prior to our acquisition. There was a reason why I as the studio founder agreed to be acquired. It was because of their independent studio culture. I believed in that model, and I still believe in that model today." Beenox started its life as a porting house, and is responsible for some 30 PC and Mac OS ports. Since being acquired by Activision, the developer has largely focused on movie tie-ins and Activision's line of Spider-Man games. Therein lies the problem. At the risk of sounding somewhat cynical, the support of a subsidiary porting house known mostly for humdrum license cash-ins is hardly likely to change anybody's opinion of the company. "Activision has always treated us as partners, rather than something to be controlled," he continued. "They've been, from a creative standpoint, really, really great. When I look at Shattered Dimensions, what were asked for at the time was 'Please make a Spider-Man game.' That was the creative direction that Activision gave us." Things aren't that bad though, Activision seemed to have taken over EA's post as the number one hate figure amongst gamers - thanks largely to the ongoing lawsuit with Call of Duty creators, West and Zampella, as well as a few clever PR moves from EA - until a surprise turnaround in early 2012 saw EA surge from behind and become the Consumerist's "Worst Company in America."